Piper is almost six months old now, and geez it has been a ride. As a vet, I know a lot about behaviour and care, but it is only when you have a dog join your family, that you look at things from a different slant. I always knew off leash areas were out there, but didn't really look into what they truly were. Our previous dog, unfortunately, never had the opportunity to go to these places, because simply, when he was a puppy, they didn't exist. But before I get started on our experiences with the local dog parks, it is important to define "dog park" and "off leash" area, as they are not the same thing. A dog park is an off leash area, but an off leash area is not a dog park. To my surprise, there are no dog parks in Wollongong, and there is only one area that comes remotely close in Shellharbour. 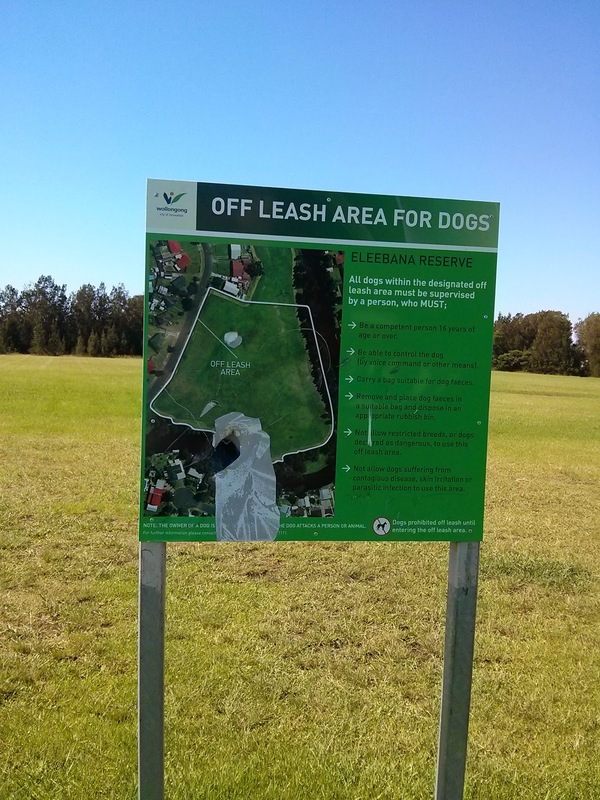 Wollongong dogs only have access to "off leash areas", which are restricted even further into what times the dog is able to be off leash. The bureacrats are using the "traffic light system" - green, orange and red (and we are supposed to remember the fine print of each of these (methinks I am not going to remember that). Green means access all the time, orange means access is restricted to certain times of the day, which changes depending on the season, and red means that it is a no go zone at any time. A "dog park" is a fully enclosed area, usually with a double gate entry (to stop accidental escapes), suitable seating and shade for pets and dogs alike, aswell as access to water and activities. There are separate areas for large and small dogs, and lots of areas where dogs can escape if being bullied or picked on. 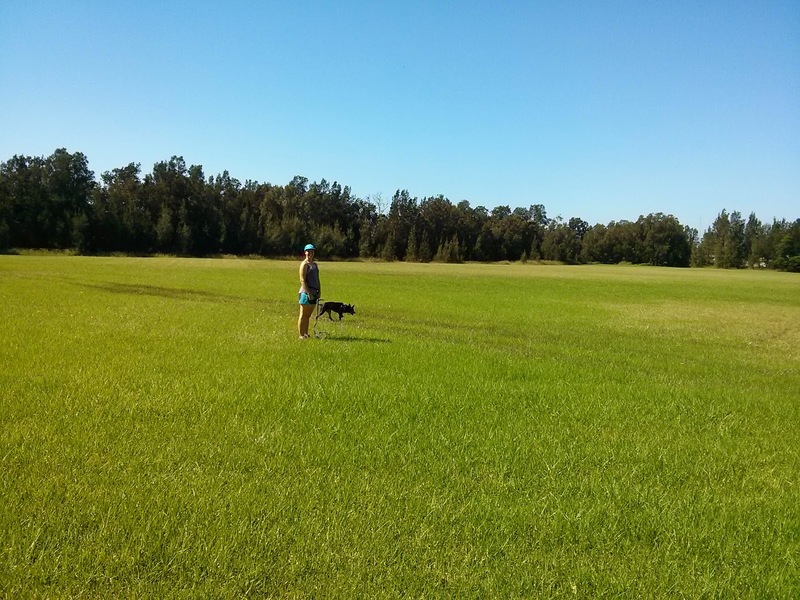 An "off leash" area is any area that a dog can run free without a leash. In NSW, the law states that out of these "off leash" areas, your dog needs to be on a physical leash (voice control is not good enough). As a side issue, I have seen dogs on a physical leash but not under effective control, and dogs who run loose next to their owners under absolute effective control, so I really disagree with governments position on this point, but, sadly, the law is what it is. But do dogs really need off leash areas? The answer is not an easy one - for some dogs, going to one of these areas is traumatic and stressful. For others, it is a chance to explore new things (such as the beach, rock pools and meet new mud puddles and the like). But, no, dogs do not really need these areas, if the owners are able to do generous walks and training twice a day. 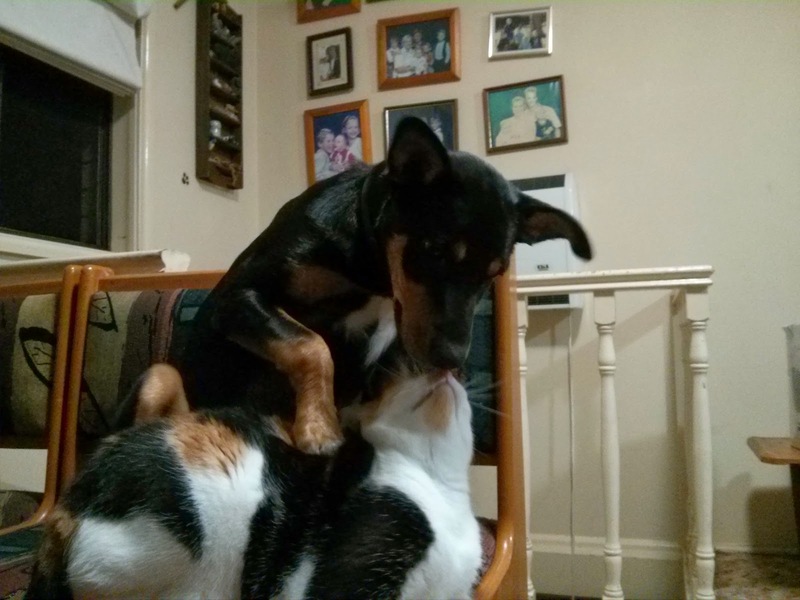 Sadly, this doesn't happen in many households. In many households, it is a once a week outing for an hour or two which then gives the owner the delusion that they are doing the right thing with their dog. 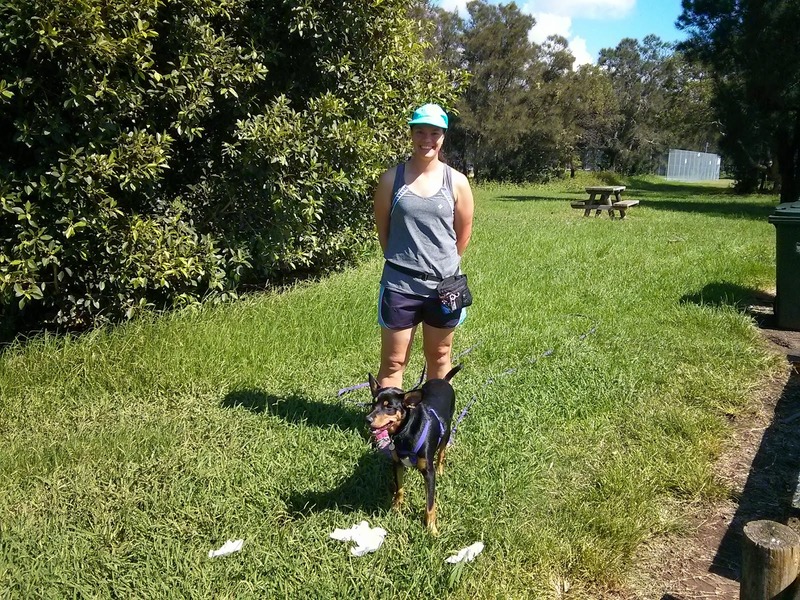 Thanks to our Piper, my eyes have been opened to what animal services are available in Wollongong, ranging from Puppy classes, dog training, and now off leash areas. So far, it has been interesting (and in many aspects disappointing), but certainly explains why there are still so many pets that develop behavioural problems and problem behaviours. Our criteria was a list of things that would be assessed, and each venue was given a score out of ten. A score was given by Piper, and by us (Tegan and I). Did we miss any point we should've considered? If so, let us know (via email or comments below). The green thing behind the bin holds the "poop bags"
definitely needed in every "dog friendly area"
This was the first one we went to, as it was the closest to where we live. Even though it was a lovely Sunday, we were the only ones there. The area was huge, but the boundary was either road or bushes (next to the creek). Lucky it is a narrow street, but during our time there, there were a few hoons (speeding idiots ignoring the 50 klm/hour speed limit). are no excuses if you "forget". The only fun stuff there were the mud puddles, because it had rained a lot the week prior! And Piper loves her mud puddles, like any kid! There were no seats to sit at to just throw the ball. There was a tap with no tap handle (i.e no water access), but there was a rubbish bin, and poop bags too. Eleebana Reserve - the area is big, but that was it! A narrow area between the park driveway and bushes. 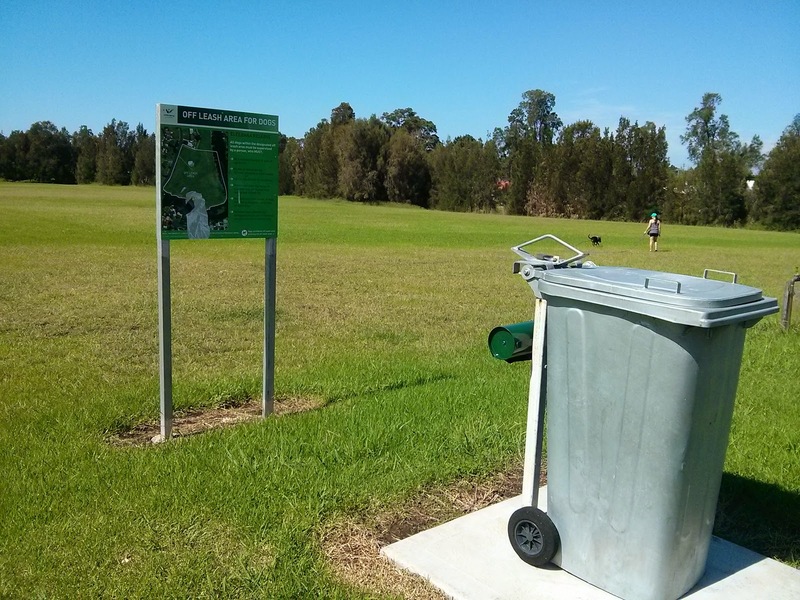 This one is in Shellharbour City Council Area. This one was a surprise in that it seemed that someone sat in their cubicle and came up with this narrow stretch of land without truly thinking it through. At least they could say they had an off leash area here! Because it is a narrow strip of land next between the park driveway and bushes, with only a low fencing (so low we can step over it) as a boundary. There was no drinking water access, limited seating, and no other fun stuff at all. Tegan and Piper in Oak Flats. It would be great for dogs to play fetch, if they just went in a straight line only. But there were great bushes for dogs to go into and explore, and lots of shade (great for those hot days). There was no drinking water, nor where there poop bags. But there was a lot of fun mud puddles, and really, dogs do love to roll in the mud, don't they! - " I loved the trees and the bushes - had a ball weaving around them. And the mud puddles were to die for"
- "At least there was some seating (if one could call the fence that) and shade". Our overall take on the situation? Well, if these two areas are an example of what is available out there for our dogs, then it is indeed disappointing. Our Council needs a kick up the proverbial, and need to offer some services for the pets in our community (other than taking pet owners money in the form of fees and fines). We are "rate payers" too! My feeling was that no thought had gone into creating dog friendly areas, but rather to satisfy government legislation about allowing "off leash" areas. It felt like someone sat at a desk or perhaps around a table, and with a red marker, circled one park every so often. 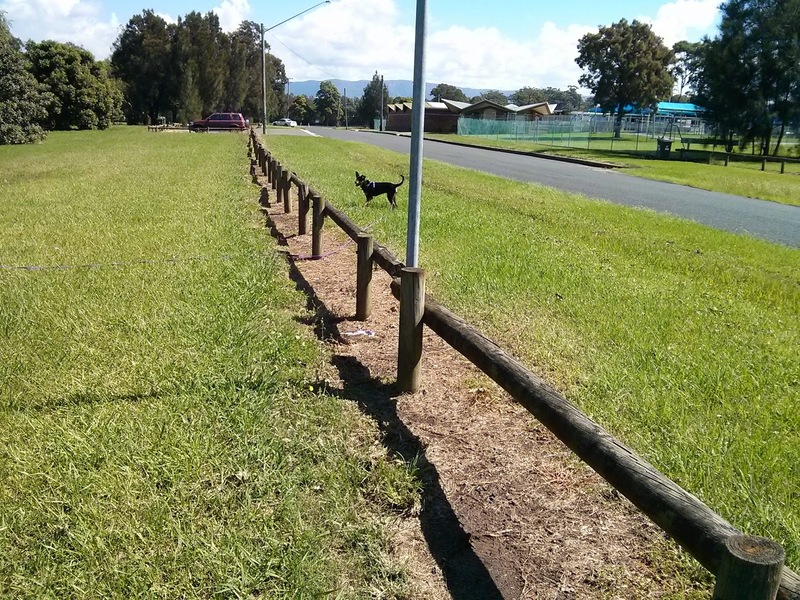 At least, council can tick off the box that says "have you adequate off leash areas for dogs". Councils can and should do better. Even so, we have to be grateful for what services they do offer. It could be worse. It could be the way it was 15 years ago, with virtually nothing. As a pet owner, and rate payer, it a disappointment. As a vet, it is downright wrong. But, the beauty of our pets, they are just happy spending time with us. That is one thing that I am grateful for - the time to be able to spend time with my family. Hopefully, as we explore more areas available in both Wollongong and Shellharbour, my disappointment will be shortlived. and being in the park with them is always a joy. Looking forward to Part Two? 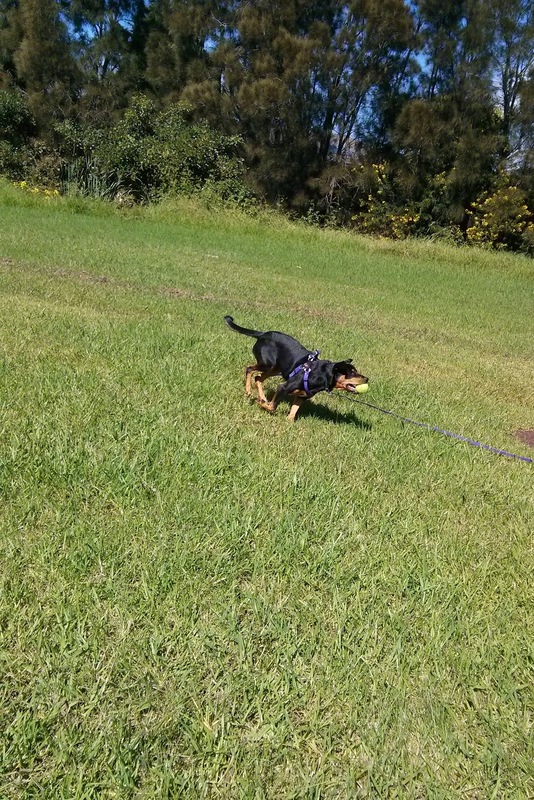 We will be visiting two other areas within the Shellharbour area, and after that, in Part Three, we heard north, to check out the ones closer to the vet hospital. 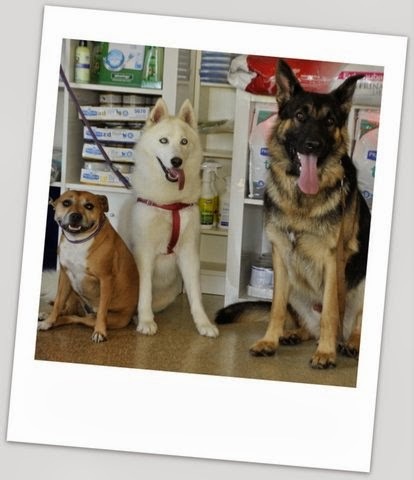 I am Dr Liz, the mad vet from Russell Vale Animal Clinic. But, I need to also acknowledge Piper and Tegan, as without them, we wouldn't be having so much fun checking out these "off leash" dog areas.